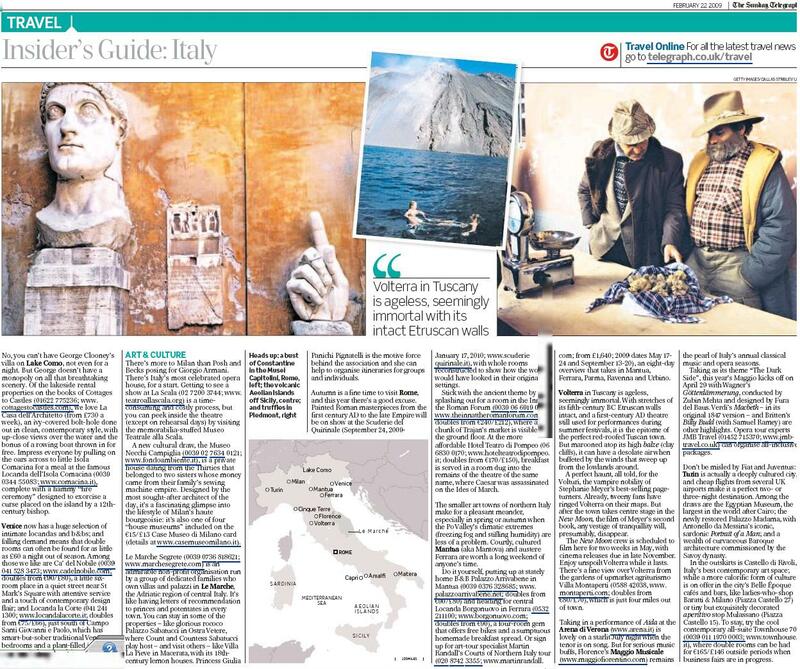 Italy may have become pricey in recent years, but the country can still offer good value, says Lee Marshall, and nowhere else offers quite the same wonderful combination of fine food, culture, art, landscape and good living. The Amalfi Coast is one of the most romantic stretches of coastline in the world, and despite its reputation as a millionaire's playground, it can also be affordable. Rent a villa or apartment through Summer in Italy (0800 047 0248; www.summer initaly.com ; from around €500/£440/per week for two). Forget car hire – private wheels are a liability here in season, when roads are jammed and there's nowhere to park. Instead, take the train to Salerno (timetables on www.trenitalia.it) and get around by SITA bus (www.sitabus.it) or on the hydrofoil ferries that link Salerno, Amalfi, Positano, and Sorrento (www.coopsantandrea.com or www.metrodelmare.com) It's a short walk from Salerno train station to the Piazza della Concordia hydrofoil wharf. And Capri and other islands are also easily accessible from most of the coastal towns. In the past, living in caves was not exactly a lifestyle choice for the inhabitants of Matera, a once desperately poor town in the instep of the Italian boot that is fast becoming the South's hot new destination. As soon as they could, the locals moved out, leaving the Sassi (the grotto district) to become a stand-in for Biblical Palestine in films such as Pasolini's The Gospel According to St Matthew and, more recently, Mel Gibson's The Passion of the Christ. Over the past decade, the Sassi has been recolonised by architecture studios, restaurants and hotels – the newest of which is the spectacular Sassi di Matera Albergo Diffuso (0039 06 678 0231; www.sassidimatera.com), which opens for business in April 2009. Think spartan luxury; think pricey (from around €300/£265 a night) but unique. Planning a special anniversary? If you're looking to defy the crisis and push the boat out, turn to Bellini Travel (020 7602 7602; www.bellinitravel.com) – owner Emily Fitzroy's Italian contact book is second to none. She can arrange for you to stay in a little harbour-side apartment on the island of Ponza, visit St Mark's in Venice after hours, or fly over Tuscan vineyards in a hot-air balloon. The Oltrarno, Florence's villagey southern quarter, is a great place to wake up in the morning with that special person. And the thing can be managed without spending a fortune. Owners Direct (www.ownersdirect.co.uk ) has several apartments for rent in the area, from as little as €350/£308 (to be sure you're in the right district, look for keywords like "Santo Spirito" and "Piazza Pitti" as you scroll down through the options). Pick up supplies at the open-air market in Piazza del Carmine on your way to breakfast at Caffè Ricchi (0039 055 215864; www.caffericchi.com), where the pastries are almost as good as Masolino and Masaccio's frescoes in the nearby church; and treat yourself one evening to a riverside table with a view of the Ponte Vecchio at elegant Borgo San Jacopo (055 281 661; www.lungarnohotels.com; dinner around €140/£125 a head for two with wine), the Tuscan restaurant of the Ferragamo group's Lungarno Hotel. Inland from Rimini, with its industrialised beach fun and cattle-market nightspots, is another world, a place of remote valleys dominated by feudal castles with a touch of Middle Earth about them. In the scooped-out moonscapes of the Val Marecchia valley, don't miss lunch at Paccini (Via Castello 5; 0039 0541 675410) a lovely rustic trattoria in Montebello, the ultimate one-street hilltop village. Farther south, in verdant Val Conca, shun the overhyped Montegridolfo – fashion designer Alberta Ferretti's twee village-hotel – and instead check in to friendly Locanda Belvedere in Saludecio (0541 982144; www.belvederesaludecio.com; doubles from €65/£58), a creative local restaurant with just five bright and contemporary guest rooms and a swimming pool amid the olive trees. There's no better way to see the rugged but chichi Aeolian Islands, north of Sicily, than from the deck of a yacht. And one of the classiest charters in this corner of the Mediterranean is Ombre Blu (0039 347 083 2995; www.ombreblu.com), a catamaran owned and skippered by an Italian chef and his Australian massage therapist wife. At around €2,900/£2,560 a head for six paying adults on a week's all-inclusive cruise, it's not cheap – but that covers pretty much everything, from transfers to and from Catania airport to three meals a day with wine, plus little treats like cocktails on the terrace of oh-so-chic Hotel Raya, with views across to the puffing volcanic cone of Stromboli. No, you can't have George Clooney's villa on Lake Como, not even for a night. But George doesn't have a monopoly on all that breathtaking scenery. Of the lakeside rental properties on the books of Cottages to Castles (01622 775236; www.cottagestocastles.com), we love La Casa dell'Architetto (from £730 a week), an ivy-covered bolt-hole done out in clean, contemporary style, with up-close views over the water and the bonus of a rowing boat thrown in for free. Impress everyone by pulling on the oars across to little Isola Comacina for a meal at the famous Locanda dell'Isola Comacina (0039 0344 55083; www.comacina.it), complete with a hammy "fire ceremony" designed to exorcise a curse placed on the island by a 12th-century bishop. Venice now has a huge selection of intimate locandas and b & bs; and falling demand means that double rooms can often be found for as little as £60 a night out of season. Among those we like are Ca' del Nobile (0039 041 528 3473; www.cadelnobile.com; doubles from €90/£80), a little six-room place in a quiet street near St Mark's Square with attentive service and a touch of contemporary design flair; and Locanda la Corte (041 241 1300; www.locandalacorte.it; doubles from €75/£66), just south of Campo Santi Giovanni e Paolo, which has smart-but-sober traditional Venetian bedrooms and a plant-filled inner courtyard where breakfast is served on warmer days.